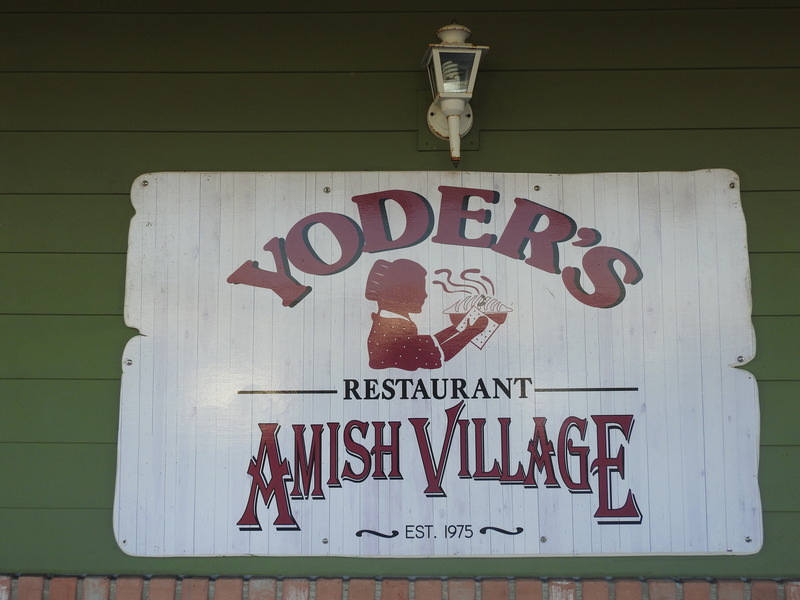 One of the signs for Yoder’s Restaurant and Amish Village. The cozy atmosphere and nostalgic decorations inside the Yoder’s Restaurant, located at 3434 Bahia Vista Street in Sarasota. 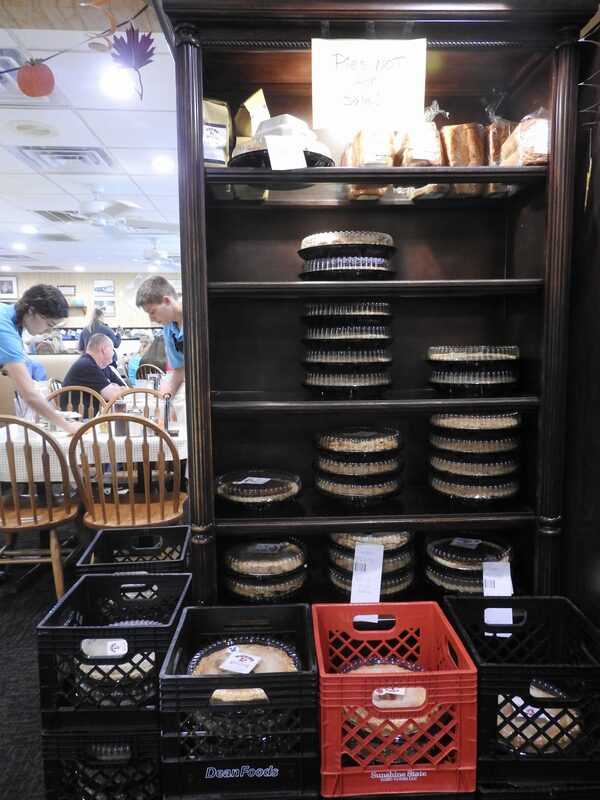 Stacks of pies reserved for customers. 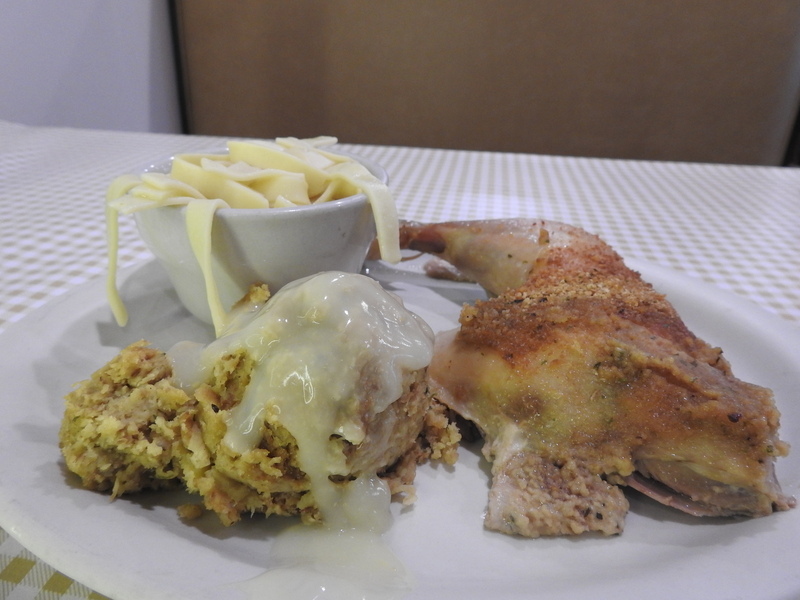 A Yoder’s customer favorite: fried chicken with a side of stuffing and Amish noodles. 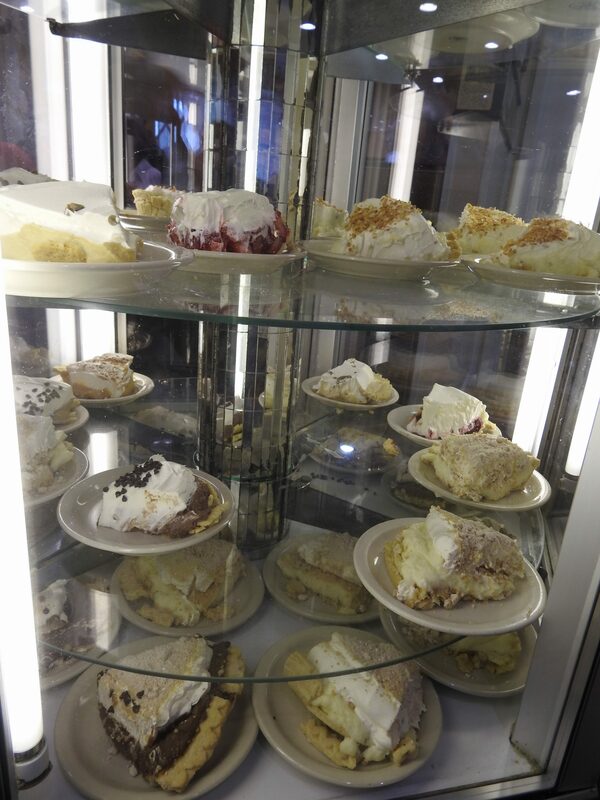 Yoder’s display of cream pies. 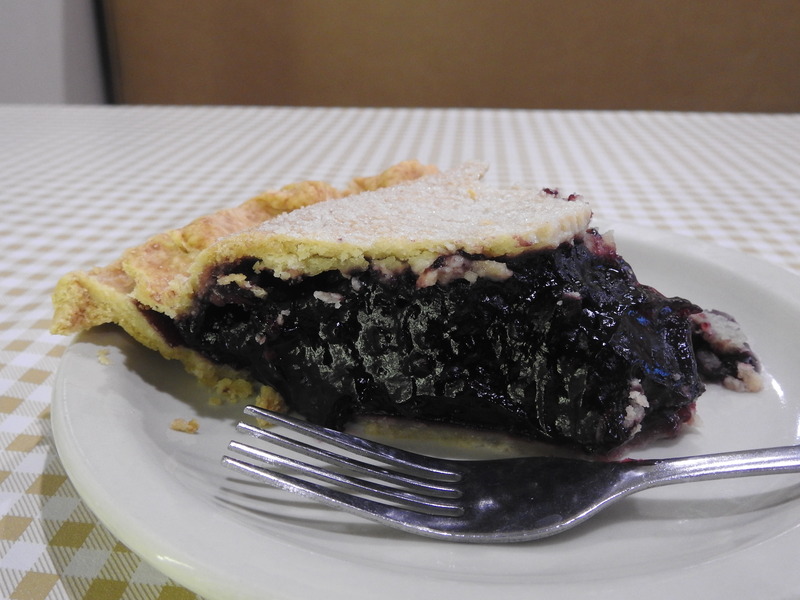 Yoder’s baked black raspberry pie. 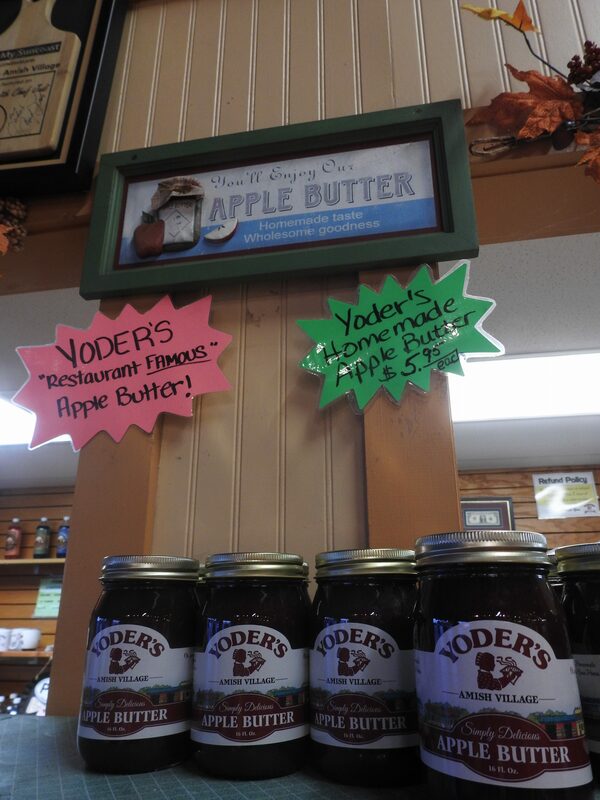 Yoder’s famous apple butter, the perfect spread. An artistic display in Yoder’s Amish Village showing visitors traditional clothing and transportation. 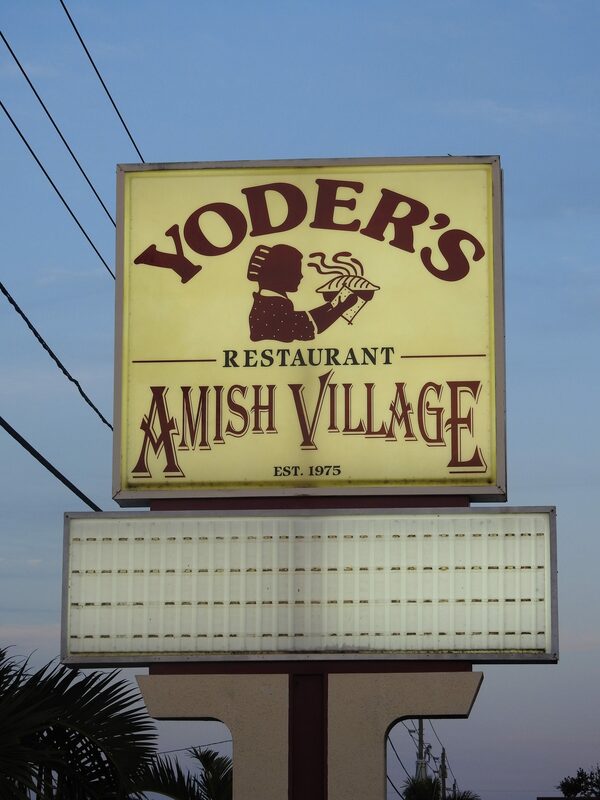 The sign for Yoder’s Restaurant and Amish Village. 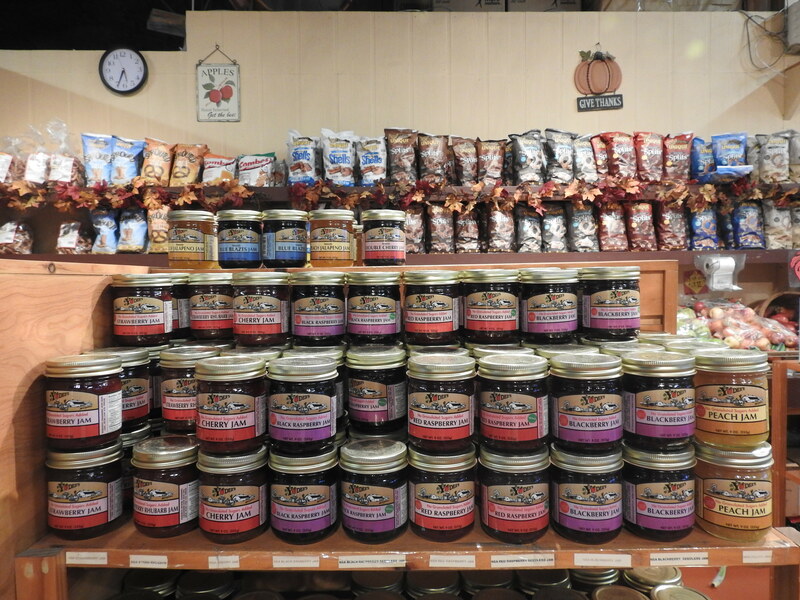 The wide variety of preserves offered by Yoder’s market. On the eve of Thanksgiving Day, dozens of customers lined up in front of Yoder’s Restaurant and Amish Village, eagerly awaiting one of their famous baked pies or a coveted seat inside the old-fashioned restaurant. 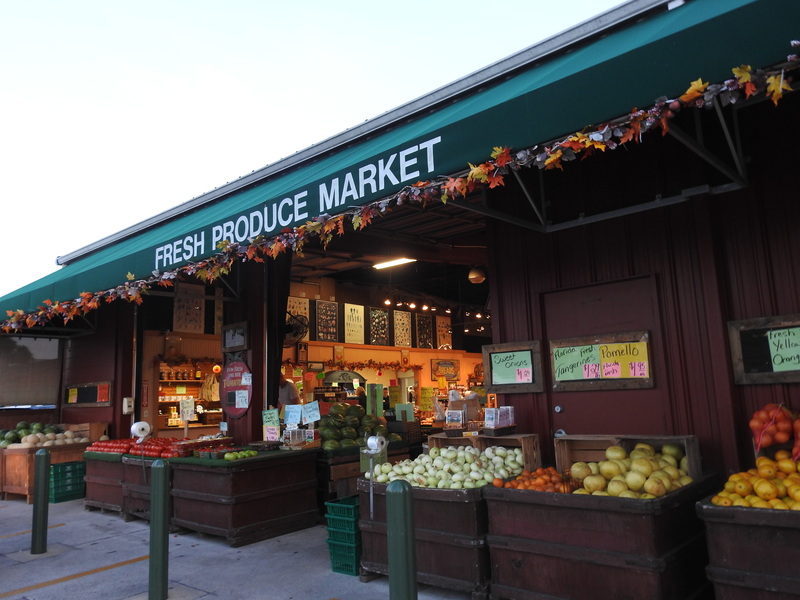 Year after year, particularly in the holiday season, curious tourists flock to the Pinecraft neighborhood of Sarasota, the winter home of approximately 3,000 Amish and Mennonites, to sample authentic Amish fare. Unbeknownst to many, “plain people,” members of Christian groups which historically settled in the northeastern and midwestern United States, including Amish and Mennonites, have been present on the Gulf Coast of Florida since the 1920s. The Amish community in Sarasota owes its origin to Amish farmer Daniel Kurtz, who brought his family to the South, purchased land and began cultivating celery. Over time, the land came to be known as “Pinecraft” and developed into a winter resort for Amish snowbirds escaping the harsh winters of Pennsylvania, Ohio and Indiana. Today, passersby can spot members of the Amish and Mennonite communities cycling or strolling across the streets of the Pinecraft neighborhood while wearing traditional, modest clothing: full-length skirts and a prayer bonnet for women and suspenders and a broad-brimmed hat for men. Amish businesses are booming in Sarasota for their high-quality crafts and food, including eateries like Der Dutchman, an Amish buffet, and Yoder’s, a longtime Sarasota favorite named the “Best Amish Restaurant” by Sarasota Magazine’s Best of 2018 Readers’ Poll. 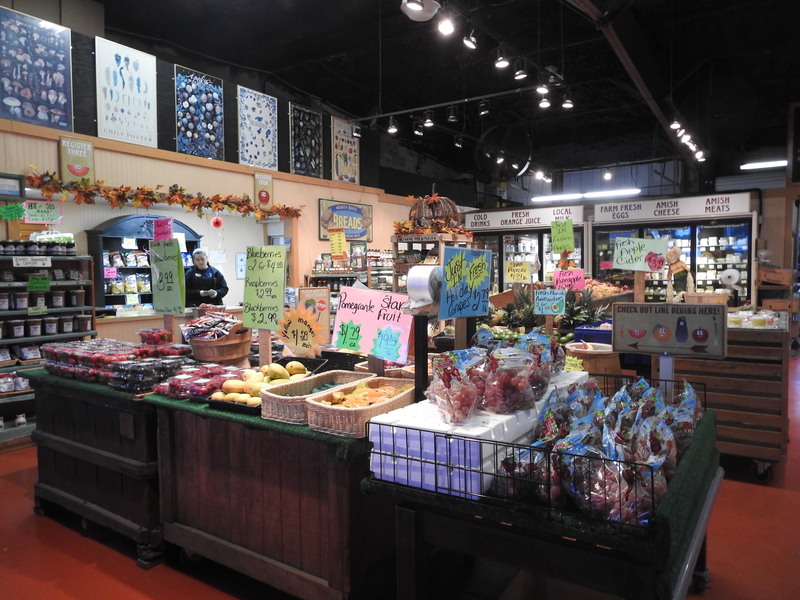 The “Village” area includes a gift shop, deli and fresh produce market. The family restaurant was also featured and commended in season two of “Man vs. Food” by host Adam Richman. 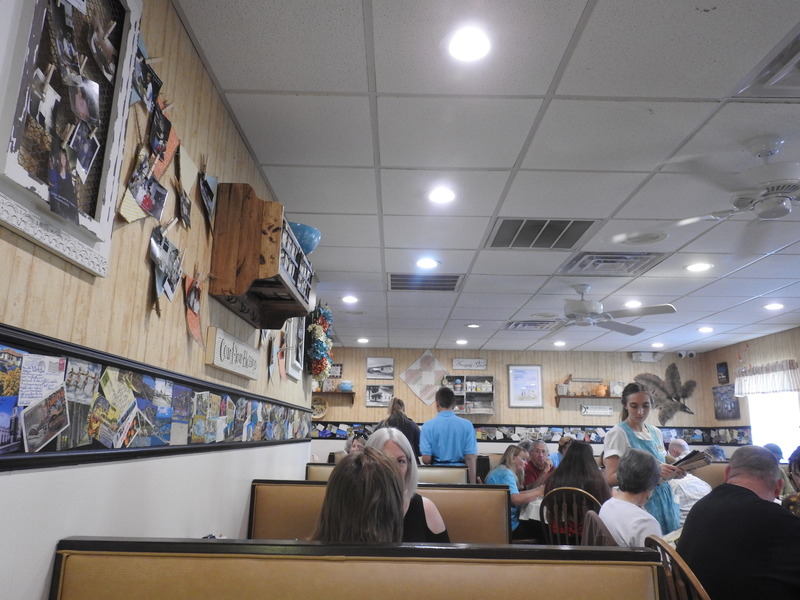 With its cozy atmosphere, home decorations evocative of grandma’s house, historical photos of founders Levi and Amanda Yoder and postcards of 20th century Florida, customers can’t help but feel nostalgic while dining at Yoder’s. As soon as food arrives, one quickly realizes that Yoder’s hearty Pennsylvania Dutch meals and comfort food do not disappoint. 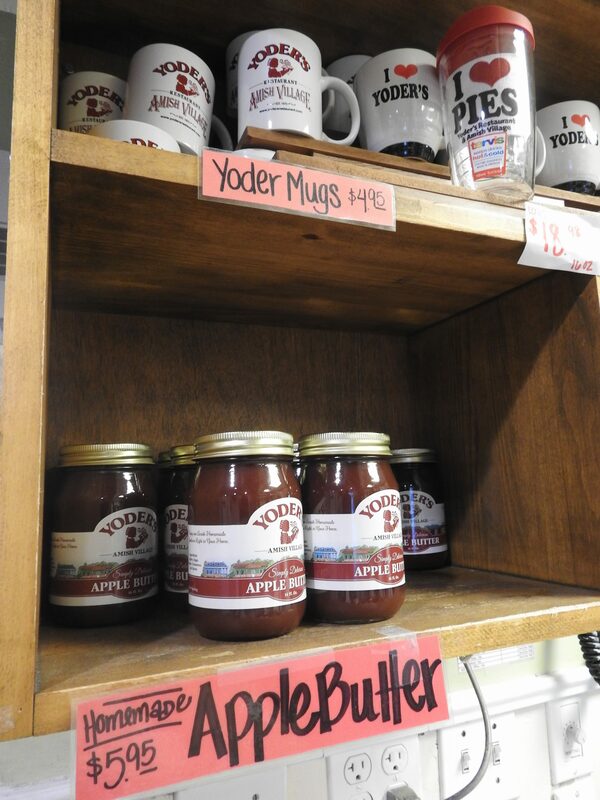 If bread is ordered for the table, Yoder’s homemade apple butter is a must-try. Apple butter is a highly concentrated, caramelized paste of apples and spices, perfect as a spread. This Amish staple is but one of many used to flavor rolls and cakes. The wide variety of jams and jellies, essential for an Amish pantry, include myriad flavors such as strawberry, black raspberry and peach. Patrons can choose from a large selection of dishes on the Lunch and Dinner Menu. 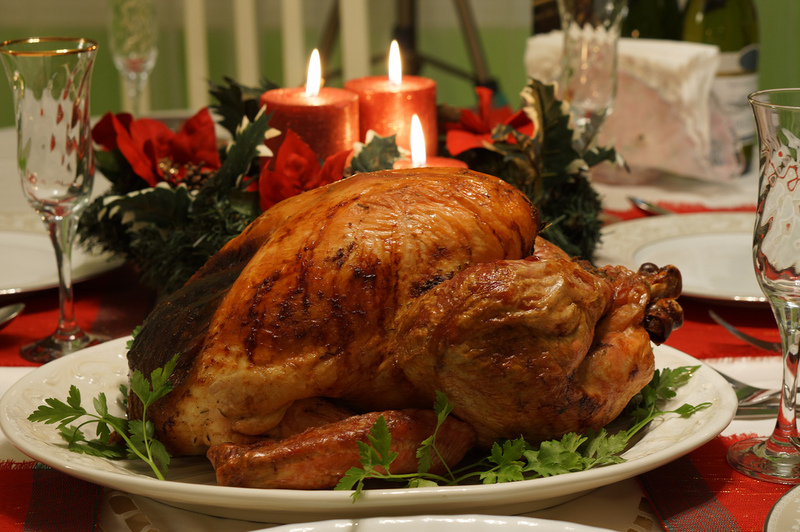 Meals include meat-based dishes such as Mom’s Meatloaf, country fried steak and roasted turkey breast and stuffing, as well as seafood options like shrimp and grits and crab cakes. Customers can elect to “Build-your-own Burger” or order a sandwich, salad or soup. Yoder’s also offers daily specials, which come with two side dishes and homemade bread. A multitude of sides are available, including Amish noodles, Amish potato cakes, cheesy grits and baked hot apples. “This is some of the juiciest fried chicken I think I’ve ever eaten,” Richman said. Although patrons may already feel full after the main course, they must make room for dessert—namely, Yoder’s famous pies, all made from scratch following the original recipes of restaurant co-founder Amanda Yoder. In November 2013, Yoder’s pies were included in the “Top 10 Pies Across the U.S.” in Cooking with Paula Deen. Pies come in over 30 flavors, either warm and freshly baked, available with a scoop of ice cream on top, or decadent and creamy. Among these flavors is Shoofly pie, or Melassich Riwwelboi in Pennsylvania Dutch, a classic Amish pie filled with dark molasses and topped with crumbs. The day before Thanksgiving, almost all baked pies had been depleted—a Yoder’s employee told the Catalyst that over 6,000 pies had been sold. “Everyone should order their pies from [Yoder’s] for Thanksgiving and Christmas,” Broadwater said. After eating course after course at Yoder’s, customers waddle out the door satisfied and more stuffed than a Thanksgiving turkey. Regardless of the season, Sarasotans should consider visiting Yoder’s for a taste of Amish cuisine, a part of America’s cultural heritage. 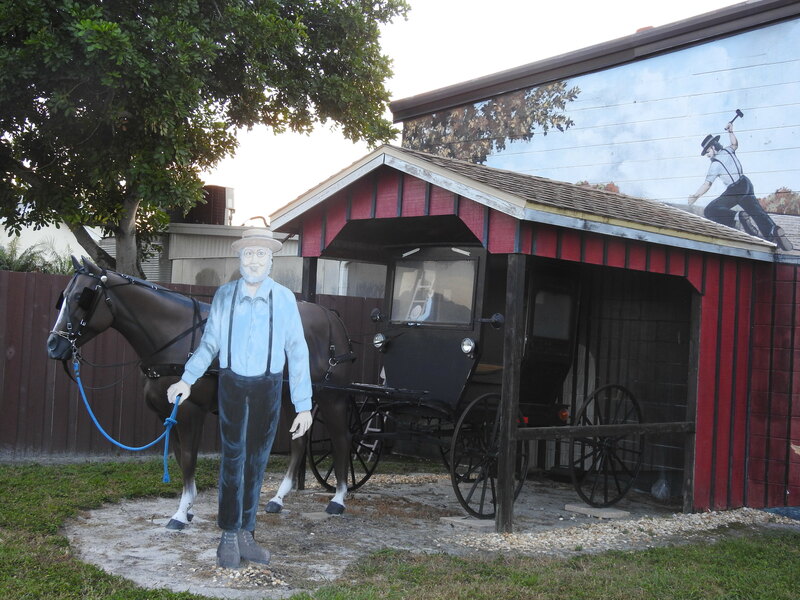 Yoder’s Restaurant and Amish Village is located at 3434 Bahia Vista St., Sarasota. Yoder’s is open every day except Sunday. Information for this article was gathered from yodersrestaurant.com, amishamerica.com, america.aljazeera.com and lancasterpa.com.